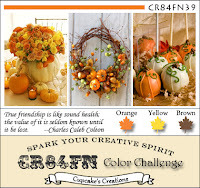 It's time for another wonderful challenge at the CR84FN Challenge Blog! Thanks so much to those of you who play along with us! Marie is joining us again as our guest, be sure to stop by and she what she's created this week. The colors for the next two week challenge period are Orange, Yellow and Brown, fab colors for all your fall paper crafting projects! I took the CAS approach for this weeks card, morphing the Expressionistic Watercolor Technique, by using Distress Stains in place of ink pads. All images are from Stampotique, stamped on Stampin' Up! 's Shimmer White card stock. Here's this weeks color inspiration, we'd love for you to play along with us at CR84FN, you can find all the details here on how to enter. If you upload to any online gallery please use keyword CR84FN39 so we can find your creations! Beautiful! Love the inking techniques you have used, the butterflies are so pretty! Love this watercolour technique - the way the ink has moved gives real depth to the images. And the sentiment is wonderful! Love this card! Lovely butterflies and the watercolor technique is beautiful. Delightful fall card. Lisa, I love your CAS card and the technique you used is fantastic. 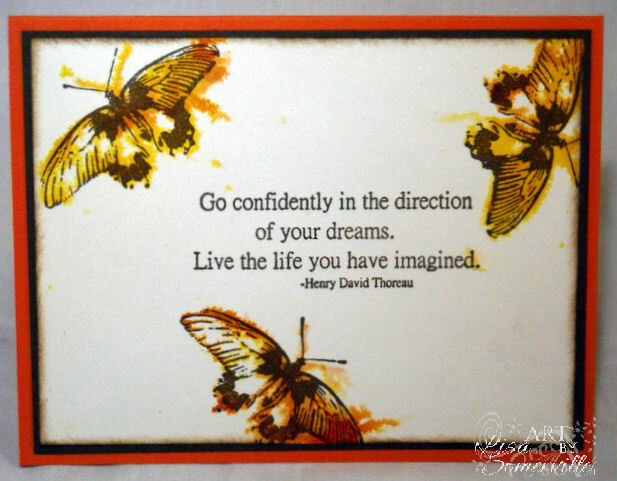 The butterflies are amazing and this is my favorite sentiment. Loverly my dear, simply loverly! Beautiful, Lisa! Love the cool watercolor technique, lovely quote and white space! Beautiful card Lisa! Those butterflies look stunning! Thanks for sharing how you achieved this look using Distress stains ~ the outcome is incredible! Love it Lisa! The colors and motion are captivating. Such a CAS BEAUTY Lisa!! Love the technique you used on the butterflies! Gorgeous! the watercolor effect looks beautiful on this card-gorgeous! WOW! Your definitely morphed something wonderful! LOVE the CAS with that FAB saying! PRETTY card! Oh, how lovely! Your watercolored butterflies are beautiful, and go so well with the sentiment. Thanks for the inspiration! Wow Lisa, love your butterflies! The colors are beautiful. I've seen so many monarchs fluttering about this week!